1.Place beef mince in a bowl and mix in a little oil. Heat the wok, ensure it is hot. Crumble in half of the mince. Stir-fry until mince is well browned. Remove first batch, reheat wok and cook remaining mince and then remove. 2.Reheat the wok, add the oil, heat oil and add the carrot, garlic and ginger. Stir-fry for 1 minute. Add the corn, stir-fry for 30 seconds. 3.Return the mince to the wok, toss for 1 minute. Push the mince mixture out to the side. Pour in the combined oyster sauce, stock and cornflour, stir as it comes to the boil. 4.Stir to mix the sauce with the mince mixture. Add the bean sprouts and coriander, toss to combine. 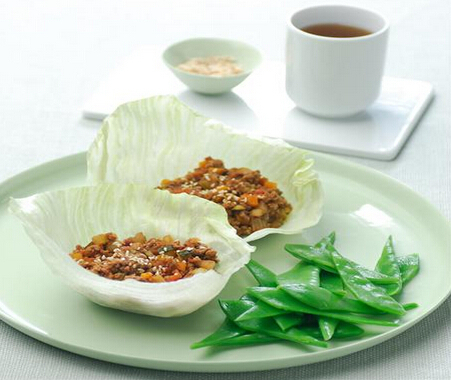 Spoon mince into serving bowl.Serve with chilled lettuce leaves.